Here comes! One of the two newly-purchased Air Tanzania's Bombardier Q400 planes on its way to Dar es Salaam. Dar es Salaam — The government yesterday clarified that the cost of maintaining its two Bombardier Q 400-8 aircraft in Canada would not exceed Sh6 billion. This comes amid strong criticisms on social media after preliminary reports that the cost would be as high as Sh13.9 billion. In the past two days, a debate ensued on social media after the minister for Works, Transport and Communications, Mr Isack Kamwelwe, was quoted as saying that the two airplanes would undergo maintenance services in Canada at a cost of over Sh13 billion. In his response to the The Citizen's questions yesterday, the minister said that the aircraft would indeed be serviced in Canada and that it was a 'Check C' maintenance level. "It [the Sh13 billion report] must have been an error," he said, referring to earlier reports trending on social media. "It seems the billion or million Tanzanian shillings and US dollars were not quoted properly, either by me or the one who published the news report," he said. "Actually, the cost for one aircraft cannot exceed Sh3 billion in maintenance services," noted the minister. According to aviation sources, this kind of aircraft service is performed at a hangar and is done every 20-24 months or after a specific number of actual flight hours (FH) as defined by the manufacturer. The time needed to complete such a check is at least 1-2 weeks. Mr Kamwelwe said further that the aircraft would be serviced in Canada as per the business agreement between the government and the aircraft manufacturer. "If there are other options? I don't know, I need to check with ATCL management first," he said when asked why the aircraft would not be serviced locally. However, he noted, the government was in the process of putting up its hangar at the Kilimanjaro International Airport (KIA), where some maintenance services would be carried out. "When this is done, the cost is expected to go down," he said. 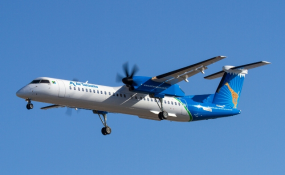 Air Tanzania Company Limited (ATCL)'s two Q400 aircraft from Canadian manufacturer Bombardier were purchased two years ago as per agreement signed in August 2016. The aircrafts are delivered with a 76-seat configuration at the price of $62 million. The purchase is part of ATCL's plan to expand in Tanzania and the African region. So far, ATCL boasts a fleet of new 6 aircraft, the biggest being a 787-8 Dreamliner, valued at $224.6 million.